Meaningful KPIs are quantifiable, able to be monitored over time, and are direct evidence of the goals they measure. This practical study of 50 organisations reveals just how many organisations do (or don't!) 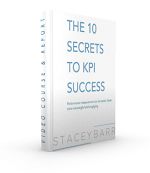 have KPIs that are meaningful. The purpose of a KPI performance dashboard is to interpret quickly and accurately how an organisation's top priority performance results are doing compared to target, and initiate action to close gaps between actual and target performance. But there are some KPI dashboard design mistakes that derail this purpose.